The photograph for second runner-up, "‘1.5 million Citizens Won’t be at Fixed Voter List’" by Yuliando of Koran Sindo (November 2016) is pictured above. The article below was selected as the second runner-up for the News reporting category. Winning and runner-up submissions can be viewed here. This article orginally appeared in Republika on 01 March 2017. Baharuddin (38), Wednesday (15/2), departed to Polling Station 043 earlier than his friends from Bina Daksa Budi Bakti Social Care House, Pondok Bambu, East Jakarta. He departed earlier as he planned to go around and sell chips after casting his vote in the 2017 Regional Head Election. As he exited the gates of Bina Daksa Budi Bakti, he asked a neighbor, “Excuse me, Sir, which way is the polling station?” The neighbor pointed a direction and Baharuddin’s arms pushed his wheelchair towards the suggested direction. 50 meters later, he met a polling station guard standing at the polling station’s exit. “May I enter the station through this opening?” asked Baharuddin. The guard was affable but stern in his refusal to allow entry, “You may not, sir. Please enter through the other opening. This one is only for exiting,” said the guard. Baharuddin then had to take a long detour around the polling station: through a crowded main street, then across a small alley with speed bumps – a journey that took at least 150 meters, five times the distance between the previous ‘exit-only’ opening with the polling station, which was only 30 meters. “What a hassle,” said Baharuddin under his breath. Thank goodness, as soon as he reached the polling station’s entrance, he received a fantastic service. The polling station staff allowed him to skip the queue. Upon exiting, the guard he spoke with earlier helped him to push his wheelchair. Half an hour after Baharuddin finished casting his vote, his wheelchair-using friends from Bina Daksa Budi Bakti came to the polling station in a group of 20. They all had to follow the same route Baharuddin did – a significant detour of around 150 meters. Baharuddin noted this experience: not only the polling station’s entry was not easily accessible, the table to cast vote was also too tall. These are common experiences faced by persons with disabilities when casting their vote. The experience in the 2017 DKI Jakarta Gubernatorial Election is the worst polling station access for Baharuddin he has undergone throughout several election cycles. Usually, since 1999, a polling station is established at Bina Daksa Budi Bakti house. “I’ve heard it from more senior denizens of Budi Bakti. My own experience of casting my vote here at Budi Bakti was in the 2014 General Election, it was very easy for me to cast my vote,” said Baharuddin. Ibrahim, Polling Station 043 Chief, confirmed Baharuddin’s statement. He corroborated that earlier, a polling station was always established at Budi Bakti. Only in the 2017 DKI Jakarta Gubernatorial Election the polling station was established outside of Budi Bakti. “We didn’t get a permit from the Budi Bakti management,” complained Ibrahim, despite having negotiated for a permit to open polling station there far in advance of the election date. Head of Bina Daksa Budi Bakti Pondok Bambu, Anna Nufika, stated that the regulation to ban the use of social care houses for polling station was a new instruction from DKI Jakarta Office of Social Affairs in order to maintain the impartiality of civil servants and caretakers of the social care facility. “It was indeed instructed by the Provincial Government through the Office of Social Affairs,” said Ms. Nufika. One of the candidate tickets running for governor in the 2017 DKI Jakarta Gubernatorial Election is Basuki Tjahaja Purnama, the incumbent, who runs with his vice governor candidate Djarot Saiful Hidayat. Hence, Ms. Nufika said, the Office of Social Affairs banned the use of any social facilities under the office as polling stations to prevent assumptions of partiality. This ban, Ms. Nufika continued, was only for the 2017 DKI Jakarta Gubernatorial Election. It is very likely that a polling station will be established at Budi Bakti again later in the 2019 Legislative or Presidential Election. From a regulatory point of view, Indonesia’s lawmakers have been very supportive for persons with disabilities in terms of enabling easy access for them to cast their vote. Example in point is Article 13 letter g of Law 8/2016 governing Persons with Disabilities, which guarantees that persons with disabilities have the full right to access electoral facilities/infrastructures in national, regional, and village head elections. Another example is KPU Regulation No. 14/2016 that delineates the technical aspects of a polling station, to ensure full access for persons with disabilities, which include a polling station’s minimum area and space for mobility, the distance between voting booth’s table and partition, the height of voting booth’s table, the height of ballot box’s table, and the availability of Braille template for voters with vision impairment. However, the regulation on paper does not always mirror the on-field implementation. Cases suffered by Baharuddin and other friends from Bina Daksa Budi Bakti was only one example, among many, revealing how difficult it is for persons with disabilities to access polling stations. 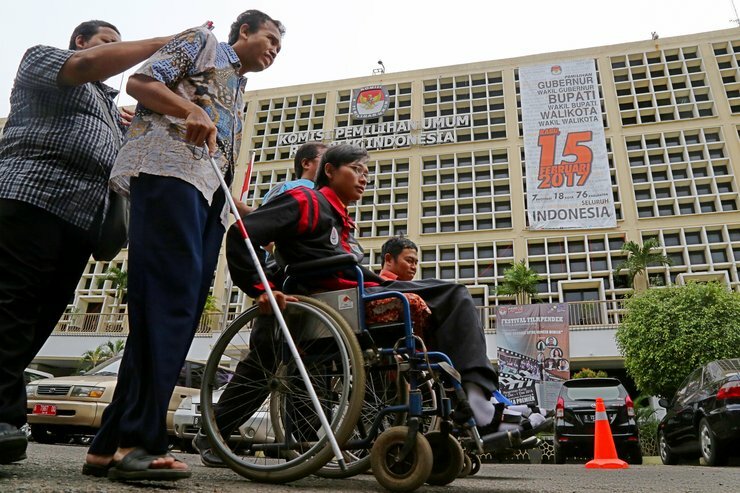 Head of Indonesia’s Persons with Disabilities Association (PPDI) Gufroni Sakaril expressed his full understanding that the ban to make a social care facility polling station is aimed to achieve impartiality of state apparatus. However, a ban must be complemented by a solution that facilitates voting for persons with disabilities living in the social care facility. “There should be the affirmation concept: siding and being supportive towards persons with disabilities by providing facilities that ease their access to cast their vote,” said Gufron. For instance, some polling station staff took the initiative to visit houses or social care facilities where voters with disabilities reside. The precedent for this is to cater for hospitalized voters. “This is not just for those with mobility impairment, but also for visual impairment and other disabilities,” said Gufron. According to Gufron, based on survey by General Election Network for Disability Access (AGENDA), an umbrella organization for DPOs working for electoral access, many persons with disabilities stated that the accessibility of 2017 Regional Head Election was still poor. The survey was held in seven provinces (DKI Jakarta, West Java, Central Java, Banten, Jambi, South Sulawesi, and West Sumatra). From the 1,227 polling stations observed in the seven provinces, only 264 (22 percent) were deemed as properly accessible, while the other 963 (78 percent) was not disability-friendly. There are seven variables AGENDA established as assessment criteria for disability access: road towards polling station, polling station’s location, polling station’s entry and exit, space for mobility inside the polling station, height of table for voting booth, height of table for ballot box, and availability of Braille template. Besides that, Gufron also noted a problem in citizenship data in the 2017 Regional Head Elections: any voters with disabilities have not been indicated properly as such. “Failure in indicate one’s disability makes them being serviced as without disability,” said Gufron. When the Fixed Voter List indicates the presence of a voter with disability, the election management staff will prepare all necessary requirements. At the very least, the polling station staff will be prepared to service voters with disabilities.